Ponca City, Okla.—July 19, 2018— Exciting big-water walleye fishing, the thrill of tournament competition, and thousands of dollars in cash and prizes await anglers when the Cabela’s Masters Walleye Circuit visits Green Bay of Lake Michigan out of Oconto, Wisconsin, August 3-4, 2018. Presented by Mercury Marine, the two-day, team-format event will launch from Breakwater Park. Cabela’s MWC Tournament Director Jack Baker expects the MWC field to enjoy fast action for walleyes of all sizes. Baker notes that strong year-classes from 2013 to 2017 provide an exceptional number of walleyes from 22 inches up to the trophy proportions Green Bay is famous for producing. The Cabela’s MWC’s lucrative payouts, based on the number of teams entered in each event, provide even more inspiration to join the fun. In addition, the MWC big-fish pot, option pot payouts and sponsor bonuses including Ranger Cup, Lowrance Electronics, Okuma, AirWave and T-H Marine Atlas Awards add thousands more to the total. Plus, the first-place team wins a $1,000 Cabela’s National Team Championship Prize Package including paid NTC entry, travel stipend, team jerseys and plaques. Such winnings quickly add up. At the MWC’s 2018 Lake Francis Case tournament, for example, winners Doug Lovro and Todd Henle collected $18,658 and the top 20 percent of the field shared more than $58,800 in cash and prizes. Teams fishing three or more tournaments also compete for coveted berths in the championship, which is comprised of the top point-accumulating teams from the previous year’s season and offers payouts based on the previous year’s participation. Teams that qualify in 2018 will fish the 2019 championship, set for October 3-5, 2019 on Wisconsin’s incomparable Lake Winnebago System. 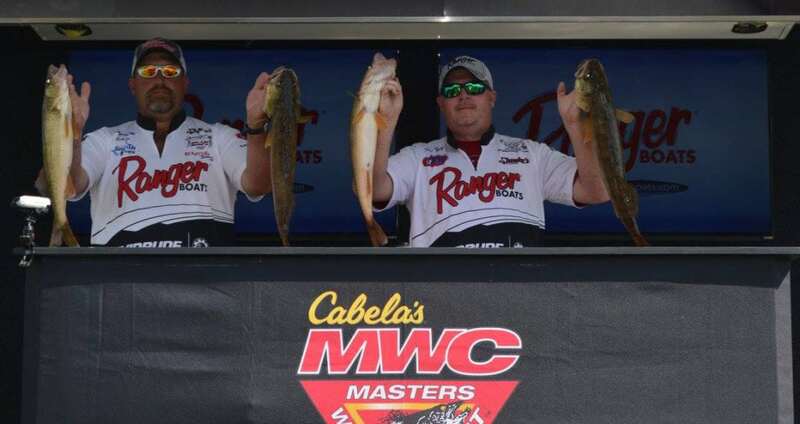 Teams fishing at least MWC four qualifiers also compete for Team of the Year awards, including a $10,000 sponsorship package and thousands more in cash and Cabela’s Cash cards, as well as fully paid entries into a full season of great walleye action. As an added bonus, Official Sponsor Lowe Equipment Attachments offers all Cabela’s MWC anglers a 25 percent discount off the MSRP on all its auger, trenching and grapple products available through Midwest Attachments, LLC. For information on that program, visit masterswalleyecircuit.com/tournaments/contingencies. Walleye fans of all ages are invited to catch the excitement and watch the trophy walleyes come in at the daily weigh-ins, which begin at 3 p.m. at Breakwater Park in Oconto. If you can’t make it in person, watch the weigh-ins live, online, at masterswalleyecircuit.com. Adding to the excitement, the Cabela’s MWC and National Professional Anglers Association will present a Youth & Family Fishing Clinic immediately after the day-one weigh-in. The first 50 youths will receive rod-and-reel combos courtesy of the NPAA.
. North America’s longest-running and undisputed leader in team walleye tournaments, the Cabela’s MWC has set the standard for competitive walleye fishing since 1984. Operated under the umbrella of The Walleye Federation (TWF), the Cabela’s MWC is open to avid walleye anglers from all walks of life. The 2018 tournament schedule includes eight qualifiers in seven states, plus the 2019 Cabela’s MWC World Walleye Championship. Registration for 2018 events is now open, and the deadline for registering for the Green Bay tournament is Monday, July 30 at 4 p.m. Visit masterswalleyecircuit.com for updates, official rules and registration information. Cabela’s, the World’s Foremost Outfitter for hunting, fishing and outdoor gear, is in its 17th season as title sponsor of the MWC. Official sponsors include: Bass Pro Shops, Lowe Equipment Attachments, Lowrance Electronics, Mercury Marine, Ranger Boats and The Walleye Federation. Associate sponsors include: AirWave Pedestals, Church Tackle, MotorGuide, Okuma, Power-Pole and T-H Marine. For more information, email info@masterswalleyecircuit.com, or call (580) 765-9031. © 2019 Masters Walleye Circuit.